JMTs flagship shear is the new VS series. JMT Variable Rake shears have a CNC control that adjusts blade clearance, cut length and cutting angle automatically. These shears are flexible and can handle thin to thick materials and narrow to wide sheets with fast cycle times. JMT Variable Rake shears can cut 1/4 inch to 1 inch thick materials in lengths ranging from 10 feet to 30 feet. For those customers who may not need the specific capabilities of the VS series JMT has another machine type that may just fit the bill. The JMT VS series shearing machines are very sleek with a well-proportioned overall outside design, it’s the insides of this cutting machine that bears closer examination. When comparing one manufacturer to another the difference of the components become very obvious. The JMT VS welcome’s the curious to take a look under the hood. The most obvious difference will be in the extremely heavy machine beam and supporting framework. The support slides that guide the beam above which integrates the blade, are massive and in many cases made of nodular cast iron. A substantial amount of nodular cast iron is incorporated into the VRS series shears so as to provide a very rigid framework to support the blade and beam. All the main components are selected from the top manufactures from around the world. On the electrical side you will find components from Siemens, Schneider and Panasonic. In the hydraulic compartment it’s Bosch-Rexroth, Vickers, and Continental. All these main components have been selected for two reasons; long lasting operation as well as local availability if at some point many years down the road, the component needs replacing. If it’s capability you’re looking for you have found the shear that will exceed your expectations. 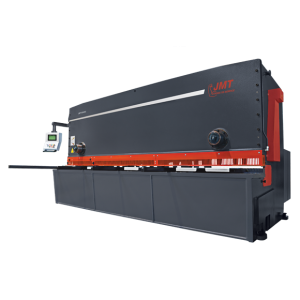 The JMT-USA VS series variable rake shear has an abundance of standard features designed to accurately shear your plate or sheet for many years to come. The VS series of shearing machines have a shearing range of one quarter of an inch to 1 inch thick plate. The operational width of these shears ranges from 10 foot 2 inches to 33 feet one inch. This series of shear also has no less than 5 different machines with an operational width of 20 feet, with a shearing capacity of one quarter of an inch to 1 inch thick plate. The JMT-USA shears are the beneficiaries of many years of production and evolving design. Many features were intergraded into these machines and were first in the industry capabilities never before seen. The VS shears come with a full length finger guard 39 inch of which can be flipped up for easy viewing of the cutting operation. Numerous “hold downs” are provided along the cutting length with hold downs closer to each other to improve safety and to hold the plate more securely at the plate ends. This design results in more accurate cuts especially on narrow plates. Each independent hold down is capable of exerting high pressure to hold the material being cut. Throat depth is a minimum of 13.78 inches to 30 inches allowing the cutting of certain required piece parts that exceed the actual working width of the shear. The standard 39 inch back gauge is positioned via zero clearance guides and recirculating ball screw. The back gauge has a setting accuracy of + – .004 and a repeatability of .0004. The back gauge comes with clearance compensation and retreats automatically when cutting narrow parts. The back gauge can also swing up and out of the way when cutting unlimited length drops. Material is easily positioned via numerous ball transfer units located all around the infeed table. Additional capabilities include user friendly D-Touch 7 C-N-C control, automatically adjusted; rake angle, blade gap, and cut length. 59 inch squaring arm with scale, 39 inch front support arms with “T” slot and tilting stop. Automatically adjusted solid hold downs, top and bottom blades with 4 usable sides. Last but not lease a operational foot pedal which can be placed anywhere around the shear. The options available for these shears are many and should be discussed with your Regional Salas Representative, so the shear can be customized to fit your exact requirements. When it comes to shearing your partner is JMT-USA. Let us apply our considerable experience and knowledge to your application so you get the shear that does just what you want it to the first time.